when is your card due to graduate? I might just pull the trigger and put $200 down. I don't really understand how it works. So i put $200 but $200 is available for me to spend immediately? I need to keep the utilization at 5% ? but I can put more money on it whenever I want? It's supposed to graduate i n7 months. do I have the idea right? My 8th statement will be my August's, I believe. A lot of people graduate with their 8th, some people have to wait longer. What happens is when you "graduate," your card status is changed from a secured card to a regular card. Some people receive credit limit increases as well. You can add money whenever you want, correct. I opened mine with $200 then two months later added another $200 for a total limit of $400. When my card graduates Discover will mail me a check with my $400. For utilization, the general consensus is less than 8.9% (so $17.80 of $200, or $35.60 of $400). Im curious.. do you have some sort of installment loan reporting on your CR? Also you still might be able to get some points for a third CC... but id wait untill the dust settles just a little bit... esp since your expecting another score bump.... perhaps in Aug? Open accounts I have two credit cards and a mortgage. June End / July Start Check-in! This card is 16 years old. Always paid on time and closed many years ago due to inactivity. Actually surprised it's still showing on my report. This card is 9 years old. Always paid on time and closed many years ago due to inactivity. Car was paid off in August 2012. Perfect payments the entire time except one 30-day late in January 2012. Just waiting for that derog to age off in January 2019. All payments made on time, paid in full March 2007. Surprised is still being reported but I'm not complaining. A paid collection that is reporting to TU and EX, but not EQ. I tried disputing it with EX because it's with ERC and I heard they are no longer able to report/verify, but it came back as confirmed so I can put that rumor to rest. I may try just straight-up asking them if they'll stop reporting, but I"m not holding out much home. It ages off in September 2019, so not too much longer on that one. A single late payment on an old car loan that ages off January 2019. I sent them a GW letter a few years ago and never heard back, so it is what it is. I'll leave it be. An old credit card that was charged off but never sent to a collection company. It's with Applied Bank and I've heard if you call them and offer full payment they will stop reporting, so I am going to try that. I just need to save up the money to do so because I refuse to touch my savings for credit repair. I have been paying extra on my mortgage principle all year, and this month I had a new notice on my EX score (from the Discover scorecard site). 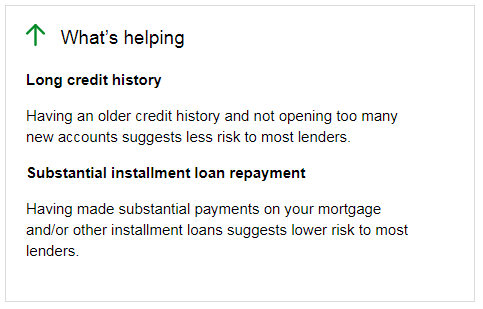 The "Substantial Installment Loan Repayment" section is new. I paid down all but $5 on my $400 limit Discover It before the statement date, which is lower than previous months. I paid my Comenity card in full before the statement date so this one reported a zero balance as usual. EX FICO 8 jumped 20 points from 617 to 637. The only thing I can think of to cause such a significant jump when I did not remove any major derogs is the above mentioned notice about "Substantial Installment Loan Repayment." TU FICO 8 remained steady at 615 - Kinda bummed about this but oh well I guess. EQ FICO 8 - I do not have my August start score for this one yet. I canceled my CCT account because I am going to get a paid MF account instead, and I am waiting a couple more days so I know the score I get is updated from last month. August, I'm ready for ya! Side note, my first Discover IT statement was in February (account opened in January), so I may be up for graduation at the end of this month. My September statement will by my seventh, and I have been a perfect client, so I am hoping they will graduate me and give me a CLI. Keep at it, OP! Your post encourages me to start good-willing.